The Citadel or "Metzuda" is not just a nice park. Citadel park is situated in the center of Safed. It's located on a hilltop and affords a great view of the Kinneret. The Citade is actually a very historic site and you can walk around the remains of what was in its day the largest Crusader castle fort in the Middle East. The citadel, 834 meters above sea level, is part of the chain of high mountains. During the time of the Temple signal bonfires were lit on these mountaintops to announce the beginning of the Jewish months and other major events. As the residents of each site would see the bonfire that had been lit on the mountain before it, it would light its own to pass the signal to the next town. Throughout history, whoever controlled Safed's citadel controlled the whole of the Galilee, including the northern pass up into what is now Syria and Lebanon. The metzuda has been fought over by every major power from the Romans onward, with the most recent battle being in 1948 during the War of Independence. Starting at the beginning of the Midrahov (main street) by the bridge, take the stairs up to Palmach Street. 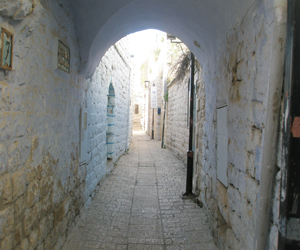 Turning left, follow the Palmach Street around and walk up a small lane located just in front of the bus stop. As you walk up the road you'll pass the archeological park on your right. After another few meters you'll see the stone bathrooms on your right and the nearby path that allows you to continue your walk up to the metzuda's summit. Due to Safed's one way road system you'll need to access Palmach Street from the junction with Jerusalem Street opposite the Palatine building, just up from the Egged bus station. Driving up Palmach before you get to the bridge over Jerusalem Street you will see Hativat Yiftah Street on your right. Take this one way road and continue until you see the parking lot alongside of the park. As you enter the park, pause for a minute at the seating area next to the memorial listing the names of the 14 fighters who fell in the battle for the Metsuda in the War of Independence. Think of all the people who lost their lives over the centuries to take control of this hill. Now you can walk up to War of Independence Monument on the top of hill without fear and on a clear day look at the wonderful view of the Kinneret (Sea of Galilee). There is a big wide space near the top where you can picnic and let the children run around.A small park is with climbing toys is also located at the top of the metzuda. Today you can walk through the ruins in the recently opened archeological park. If you transport yourself back in time you can imagine watching anxiously for the first signs of dust coming up the valley, which was the signal that the enemy army was on its way to attack the citadel. Returning from your visit to the past, continue on into the hustle and bustle of Safed. Cross the road and almost opposite you will see a path going down to Jerusalem Street which comes out in front of the Municipality Building (City Hall) and the Davidka Monument. Continue driving down Hativat Yiftah, passing the Ron Hotel, until the road meets Jerusalem Street at the circle (roundabout). Here, you can go right towards the bus station, or alternatively almost straight across down into Ari Street towards the cemetery.